Buster Keaton was not the Great Stone Face so much as a man who kept his composure in the center of chaos. Other silent actors might mug to get a point across, but Keaton remained observant and collected. That's one reason his best movies have aged better than those of his rival, Charlie Chaplin. He seems like a modern visitor to the world of the silent clowns. Consider an opening sequence in "The General” (1927), his masterpiece about a Southern railway engineer who has "only two loves in his life” -- his locomotive and the beautiful Annabelle Lee. Early in the film, Keaton, dressed in his Sunday best, walks to his girl's house. He is unaware that two small boys are following him, marching in lockstep--and that following them is Annabelle Lee herself (Marion Mack). They go inside. He sits next to her on the sofa. He becomes aware that the boys have followed them in. His face reflects slight unhappiness. He rises, puts on his hat as if to leave and opens the door, displaying such courtesy you would think the boys were his guests. The boys walk out and he closes the door on them. He is not a man playing for laughs, but a man absorbed in a call on the most important person in his life. That's why it's funny. That's also why the movie's most famous shot works--the one where, rejected by his girl, he sits disconsolately on the drive-rod of the big engine. As it begins to move, it lifts him up and down, but he does not notice, because he thinks only of Annabelle Lee. This series of shots establishes his character as a man who takes himself seriously, and that is the note he will sound all through the film. We don't laugh at Keaton, but identify with him. 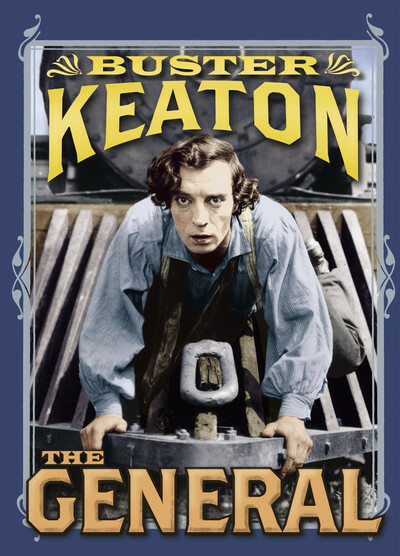 "The General” is an epic of silent comedy, one of the most expensive films of its time, including an accurate historical recreation of a Civil War episode, hundreds of extras, dangerous stunt sequences, and an actual locomotive falling from a burning bridge into a gorge far below. It was inspired by a real event; the screenplay was based on the book "The Great Locomotive Chase,” written by William Pittenger, the engineer who was involved. As the film opens, war has been declared and Johnny Gray (Keaton) has been turned down by a rebel enlisting officer (he is more valuable as an engineer, although nobody explains that to him). “I don't want you to speak to me again until you are in uniform,” Annabelle declares. Time passes. Johnny is the engineer of the General, a Southern locomotive. The train is stolen by Union spies, and Johnny chases it on foot, by sidecar, by bicycle and finally with another locomotive, the Texas. Then the two sides switch trains, and the chase continues in reverse. Annabelle was a passenger on the stolen train, becomes a prisoner of the Union troops, is rescued by Johnny and rides with him during the climactic chase scenes that end with the famous shot of the Texas falling into the gorge (where, it is said, its rusted hulk remains to this day). It would seem logically difficult to have much of a chase involving trains, since they must remain on tracks, and so one must forever be behind the other one--right? Keaton defies logic with one ingenious silent comic sequence after another, and it is important to note that he never used a double and did all of his own stunts, even very dangerous ones, with a calm acrobatic grace. The train's obvious limitations provide him with ideas. An entire Southern retreat and Northern advance take place unnoticed behind him, while he chops wood. Two sight gags involve his puzzlement when rail cars he thought were behind him somehow reappear in front of him. He sets up the locations along the way, so that he can exploit them differently on the way back. One famous sequence involves a cannon on a flat car, which Keaton wants to fire at the other train. He lights the fuse and runs back to the locomotive, only to see that the cannon has slowly reversed itself and is now pointed straight at him. One inspiration builds into another: To shield himself from the cannonball, he runs forward and sits on the cowcatcher of the speeding Texas, with no one at the controls and a big railroad tie in his arms. The Union men throw another tie onto the tracks, and Keaton, with perfect aim and timing, knocks the second off by throwing the first. It's flawless and perfect, but consider how risky it is to sit on the front of a locomotive hoping one tie will knock another out of the way without either one smashing your brains out. Between chase scenes, he blunders into a house where the Northern generals are planning their strategy, and rescues Annabelle Lee--but not before Keaton creates a perfect little cinematic joke. He is hiding under the dining table as the Northerners confer. One of them burns a hole in the tablecloth with his cigar. Annabelle Lee is brought into the room, and we see Keaton's eye peering through the hole--and then there's a reverse shot of the girl, with Keaton using the hole in the cloth to create a “found” iris shot--one of those shots so beloved of Griffith, in which a circle is drawn around a key element on the screen. “The General” was voted one of the 10 greatest films of all time in the authoritative Sight & Sound poll. Who knows if it is even Keaton's greatest? Others might choose “Steamboat Bill, Jr.” (1928). His other classics include “Our Hospitality” (1923), “The Navigator” (1924), “Go West” (1925) and “The Cameraman” (1928), in which he played a would-be newsreel photographer who lucks into his career. Born in 1897, the same year as the cinema, he grew up in a vaudeville family. As part of the act, he was literally thrown around the stage; like W.C. Fields, he learned his physical skills in a painful childhood apprenticeship. He started in films with Fatty Arbuckle in 1917 and directed his first shorts in 1920. In less than a decade, from 1920 to 1928, he created a body of work that stands beside Chaplin's (some would say above it), and he did it with fewer resources because he was never as popular or well-funded as the Little Tramp. Then the talkies came in, he made an ill-advised deal with MGM that ended his artistic independence, and the rest of his life was a long second act--so long that in the 1940s he was reduced to doing a live half-hour TV show in Los Angeles. But it was also long enough that his genius was rediscovered, and he made a crucial late work, Samuel Beckett's “Film” (1965), and was hailed with a retrospective at Venice shortly before his death in 1966. Today I look at Keaton's works more often than any other silent films. They have such a graceful perfection, such a meshing of story, character and episode, that they unfold like music. Although they're filled with gags, you can rarely catch Keaton writing a scene around a gag; instead, the laughs emerge from the situation; he was “the still, small, suffering center of the hysteria of slapstick,” wrote the critic Karen Jaehne. And in an age when special effects were in their infancy, and a “stunt” often meant actually doing on the screen what you appeared to be doing, Keaton was ambitious and fearless. He had a house collapse around him. He swung over a waterfall to rescue a woman he loved. He fell from trains. And always he did it in character, playing a solemn and thoughtful man who trusts in his own ingenuity. “Charlie's tramp was a bum with a bum's philosophy,” he once said. “Lovable as he was, he would steal if he got the chance. My little fellow was a workingman, and honest.” That describes his characters, and it reflects their creator.